Our Referral Program has been designed to “thank you” for sending new clients our way and for your confidence in our abilities. We know that “word of mouth” recommendations are one of the highest compliments a company can receive. When you recommend our services to a prospective client and that recommendation ultimately leads to a new exterior home improvement assignment ($2,500.00 or more), we will provide you, the referrer, with a $100.00 reward! It's that simple! When your friends, family and business associates mention that they may be interested in a new exterior remodeling project, simply recommend Nassau Suffolk Exteriors. Ask them to mention your name when they contact us. Then, please contact us to let us know that we may be contacted by your referral. There is no limit on how many times you may take advantage of our offer! 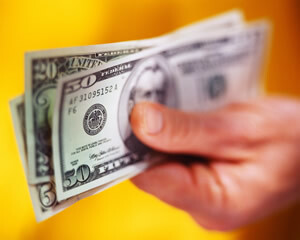 Only one reward of the $100.00 payment will be awarded per referred client. Offer available for referrals that generate new exterior home improvement projects of $2,500.00 or more. Referral rewards will be paid to the referrer within thirty days after Nassau Suffolk Exteriors, Inc. has received the final payment from the referred party. 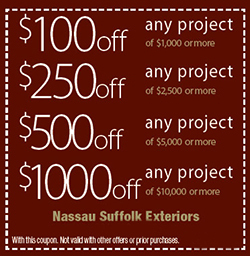 Just print out the coupon and present it to us when one of our exterior home improvement experts comes to your Long Island home to work on your FREE consultation. Schedule your FREE consultation by calling us at 631.499.2900, or by filling out our online form. Check back here often for new special offers and coupons. 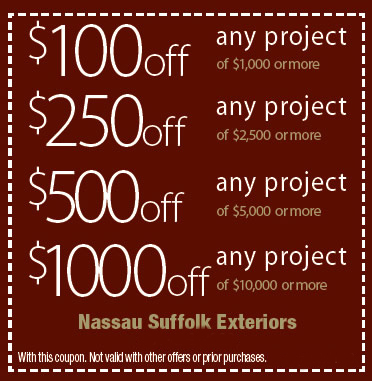 If you're looking for more specials on replacement windows, siding, and roofing in Long Island, call Nassau Suffolk Exteriors at 631-462-1383, or fill out our online request form.